Amazon has the breakthrough album from Phoenix - Wolfgang Amadeus Phoenix - for only $5.99 on CD ($7.99 for download). Dirt cheap for an album that made many year-end lists. Steve Harris is graciously sharing more interviews with Jellyfish via YouTube. These are from 1990. Justin Currie of Del Amitri is releasing his second solo album this April called The Great War. "The Great War" differs from "What Is Love For" in several ways. It is not specifically designed to push the weak-willed and suicidal over the edge of the abyss. It is a rock group record, performed live on the whole, prominently featuring two electric guitarists. It is mainly prescribed for those who desire the elevator operator selects an upper floor. Those who seek the comforting melancholy of the basement are advised to take the stairs - we'll be with you soon enough after we take a brief glimpse of how this city looks on a clear January afternoon, steam pouring from roofs and the white tops of hills on the horizon. The man has a way with words, which is what I've always loved about Del Amitri. I didn't care too much for What Is Love For - perhaps because I've never been near the precipice - so I'm quite glad to hear he's in a better mood. Paste offers a free MP3 of Matt Pond PA's Starting. Yep. Free. Nice. New album The Dark Leaves out April 6. Thanks, BoingBoing. Oh, and Cary Elwes will play George Harrison. In other Beatles-related news, Dhani Harrison seems to be ruling out a Beatles' offspring group. The idea sounds cool but it could never live up to expectations anyway. And Ringo Starr's new album Y Not is out today. Download it from Amazon.com here. Finally got to see Up in the Air last night. Clooney is fantastically Oscar-worthy and the story is good - I highly recommend it. I was struck by the fantastic soundtrack though. One song during a pivotal scene really blew me away . The deliciously folksy tune is called Help Yourself by Sad Brad Smith, a formerly unknown musician from Chicago. Read more about him here and click the image to plop down a mere $.99 for stellar tunage. Could he be the one to pick up where Elliott Smith left off (he's also on the soundtrack, btw)? It's rare to find another House of Love fan let alone a blog post about them complete with a bootleg! The House of Love was one of my favorite bands during my formative years because they could be majestic and moody, noisy and melodic all in the same breath. The brilliance of Shine On is unquestionable - it would easily make a top ten list of my favorite songs of all time (minus Beatles naturally). Popdose made me smile this evening. Enjoy this performance from 1990, which was recorded during their peak. Julian Lennon and James Scott Cook give a great acoustic rendition of "Lucy". Julian is looking and sounding great. Can't wait for his next album. It's hard to imagine any of you loyal Too Poppy readers do not own something as fundamental as Radiohead's Kid A. If not, Amazon.com MP3 is selling it for a dirt cheap $1.99 today only. Click away over to the right. Today is January 8, by the way. Is R.E.M. 's Monster the "most toxic used CD of all time? One writer recounts his seven-year journey to find a buyer for the multi-platinum hit. “Nope, too many of those” and “Oh, hell no” were the common responses. I suppose many buyers were hoping to hear Man on the Moon and Everybody Hurts again. Instead they were treated to Crush With Eyeliner and Bang and Blame. Sure, Monster was no Automatic for the People (few albums come close), but it's certainly a keeper! You can almost do anything you want with them, and they still retain the sentiment, the ideas and the inertia that Pink Floyd put into it. Paul McCartney plays bass on one of Travis' Fran Healy's new songs from his upcoming solo album. "One of the biggest coups was getting Paul McCartney to play bass on a song," Healy wrote on his blog at FranHealy.com. "I'm not sure what non-McCartney songs he's played bass on but I couldn't think of many. Anyways his bassline is brilliant." Yoko Ono is finally going to write her memoirs. I wonder if it will be set in ALL CAPS? 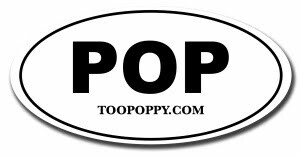 2009 was a busy year for TooPoppy with over 300 posts. To celebrate, we've created an iTunes iMix of some of the music we've covered over the past 365 days. These 55+ songs are just a taste of what 2009 had to offer. Enjoy!